Yes, the trailer is so awesome that I'm going to break it down. Let's start with the narration. It's perfect for the trailer. It captures the mood immediately. A debate I have been having with my friend though is whether they just got some guy to do narration for the trailer, or if it is an actual character in the movie. Rumors had been going around for a while that perhaps Benedict Cumberbatch would be in the movie and this narrator's voice reminded me of his from The Hobbit: The Desolation of Smaug. Check out this video here of Cumberbatch doing the motion-capture work and see how similar the voice is. My friend pointed out that it could be Andy Serkis (and we know he is in the movie), but I don't think it sounded much like him. It's definitely a possibility. We open to a shot of a desert world, presumably Tatooine. The narrator speaks. Then, a Stormtrooper pops up (literally). who is most likely John Boyega's character. 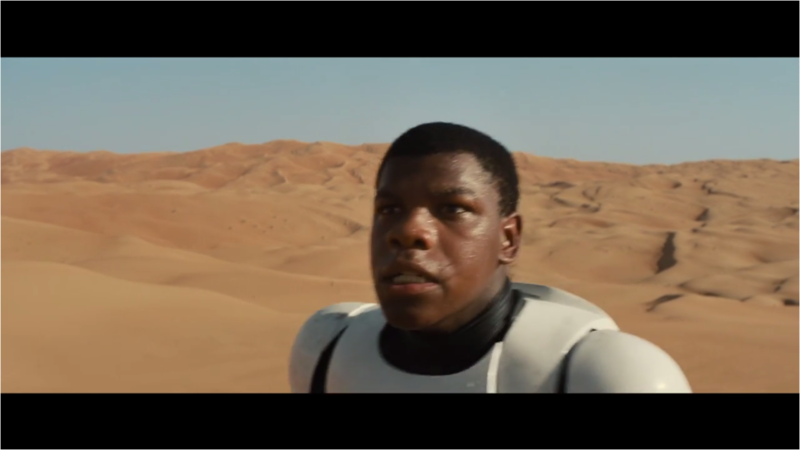 That had been rumors that his character would be a Stormtrooper, which is now official. He stands up and looks off into the distance, presumably under attack. This looks as if it could be the beginning sequence of the movie which, whatever unfolds here, could potentially kick off the events of the movie. 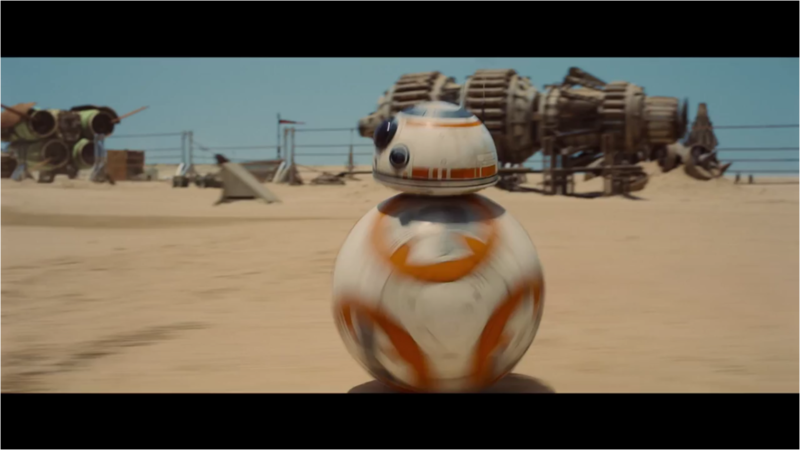 Then there's a shot of a droid's head (an R2-D2 type droid) riding on a soccer ball. I didn't like this because it felt out of place with the rest of the trailer. And, it honestly felt reminiscent of the goofy, silly tone of the prequels. 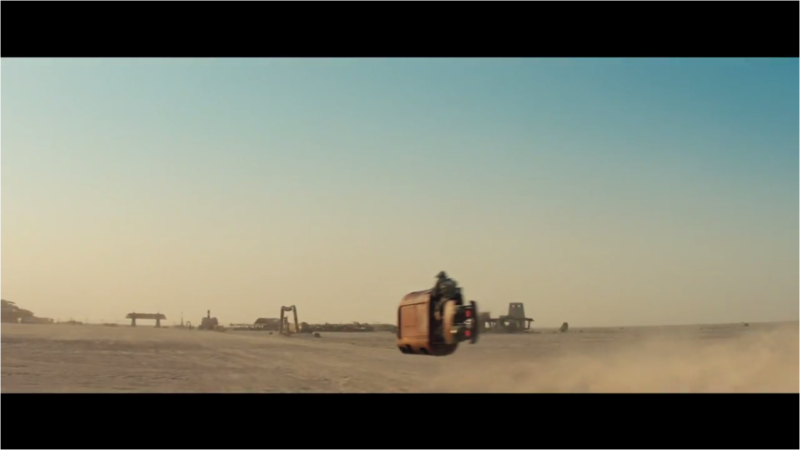 But this, in my opinion, is the trailer's only weak point. 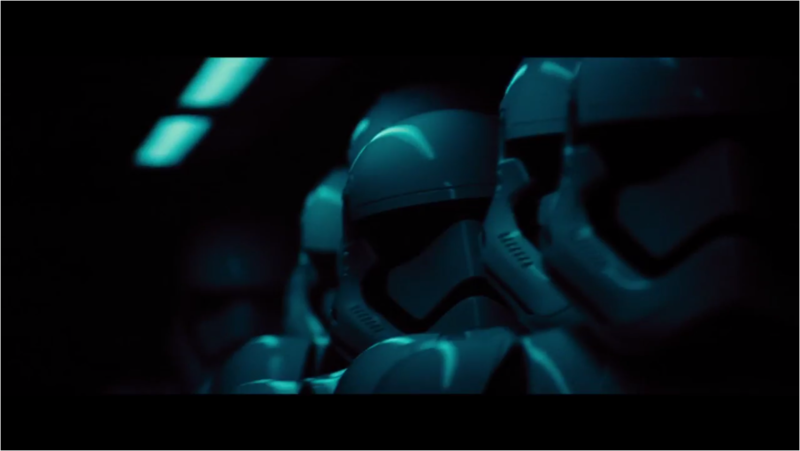 Next we see a line of Stormtroopers. There was concept art going around a while ago with new designs for the helmets, and it seems that it was real. The new Stormtropper design looks great and they look menacing. We see the Stormtroopers grip their weapons. The hanger opens and while the trailer would lead us to believe they are in the same place as Boyega, they clearly aren't. It's easier to see in the trailer than this picture, but they are getting out in either a very windy or snowy, dark place. Maybe they are at Hoth? We then see this character, who is most likely Daisy Ridley, looks behind her, then starts her pod and escapes. She seems to be chased. Maybe by Boyega? 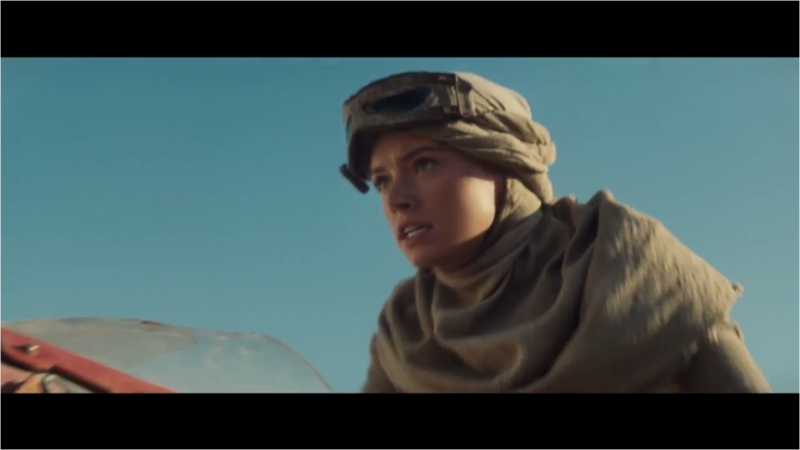 With this shot of the world she is on, it looks more and more like Tatooine. Here's a theory. Maybe the complex seen in the distance is Skywalker Ranch and an older Luke has retired there, and Ridley has been sent to bring him out of hiding. That's a possibility. 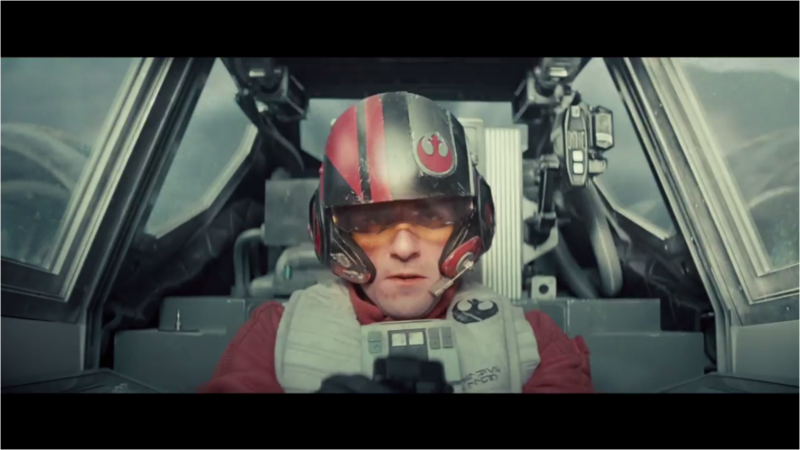 Next we see what looks to be Oscar Isaac as a fighter pilot. From the markings and colors, he looks to be a rebel. This scene would probably take place later on in the movie after the Republic has been rebuilt. 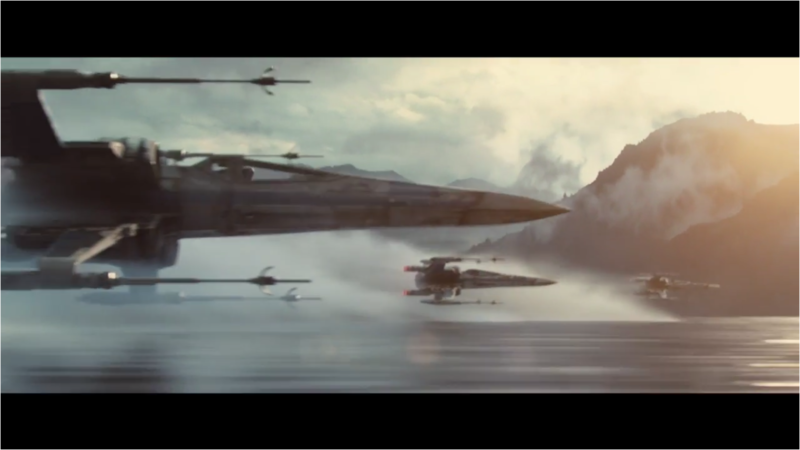 We then see, what is most likely the same scene, a group of X-Wings fly out over a lake. Either these are all on the same side, flying out for an attack, or the rebel from before is being surrounded by the enemy. Either way, this looks as if it will be an epic sequence. We then see a cloaked figure, presumably a sith, stagger out into the woods. He seems to be limping, so perhaps he was wounded in a fight. He then pulls out his lightsaber and we see a brand new design that, thanks to the perfect choreographing of the shot, made me jump and gave me goosebumps. 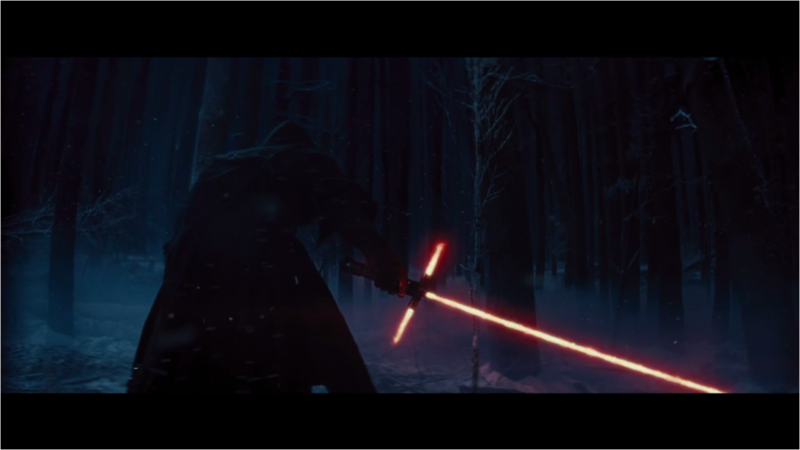 That new lightsaber looks menacing. If the narrator was indeed Cumberbatch, maybe this is his character. If so, that would elevate this movie to the next level for me. 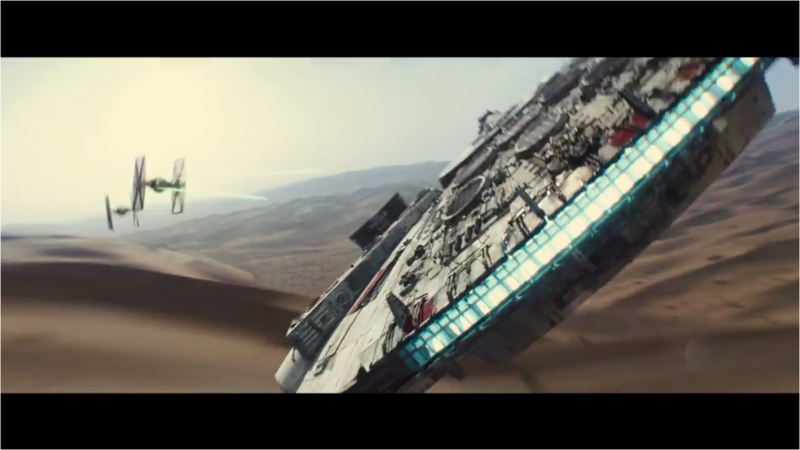 The screen goes to black and then out shoots the Millennium Falcon and the classic John Williams Star Wars theme plays. When this happened, I actually raised my hands up in the air and cheered. 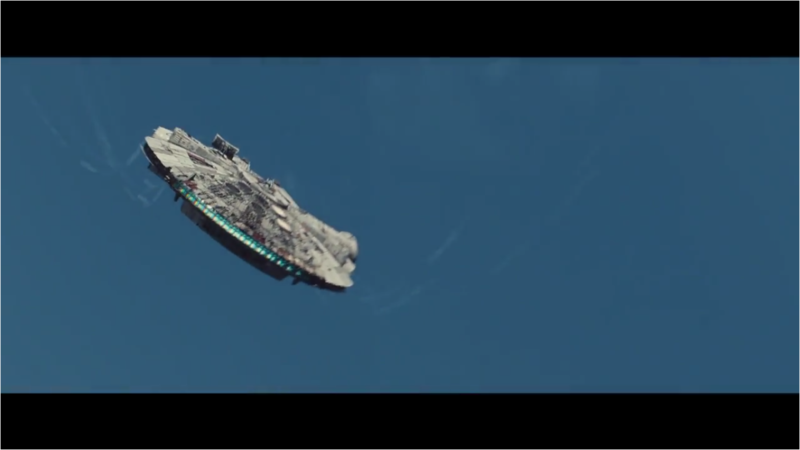 The Millennium Falcon then goes and does this really cool twist and flies upside down. The shot looked beautiful and very well done of Abrams part. The trailer then ends with the Millennium Falcon flying out into a battle and then goes to black. Then the title appeared. This trailer was absolutely perfect. And it was the definition of a teaser trailer. It showed us a bunch of different shots of what's going on in the movie without spoiling anything. And it sure as hell got me pumped for this movie. Enough of my nerd-ranting. What do you think? Did you like the trailer? Are you looking forward to Star Wars: The Force Awakens? Leave your thoughts in the comments section below.